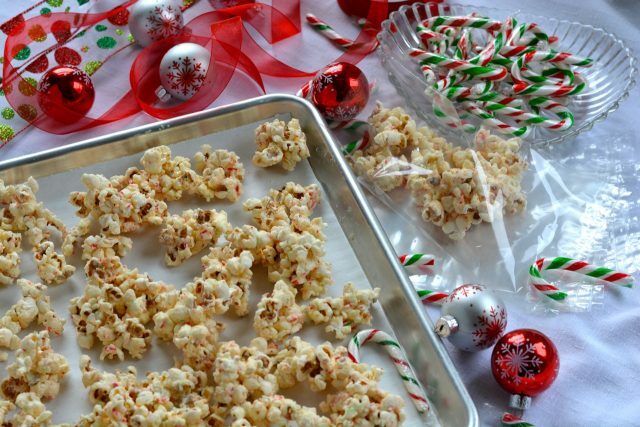 White Chocolate Candy Cane Popcorn is a dead easy, no-bake recipe anyone can make. If you stocked your pantry for the baking season with chocolate and candy canes then this is a perfect last minute gift. Well, it seems that gluten free candy canes are harder to find than expected. Most candy cane boxes list the dreaded words may contain wheat. Of course you may wonder why? Can’t they just wash the equipment? Is there really gluten in the air for a two kilometer radius around every factory in North America? For these questions I do not have an answer. So the usual advice applies…read every label, plan well in advance. Stock up for the season or use any hard peppermint candies. Kids love doing this job but if none are available it is a great stress reducing exercise. To crush candy canes I put them in a freezer type plastic bag which is slightly more durable than a regular sandwich bag. Place the bag on a cutting board and smash the candy canes with the smooth side of a mallet. A hammer would work too but it takes longer. Pulverize them to a powder if you like or leave some pieces large enough that you can see some of the candy cane colour. For kids and all popcorn lovers it is worthwhile owning an old-fashioned hot air popcorn maker. They are inexpensive and last forever. The one I have was actually gifted to me when my mom decided she didn’t use it anymore. That was twenty years ago and it is still going strong. Popcorn recipes are usually no-bake recipes so that is another plus for some families. You can create a fun activity, eat when it is over and never turn on the oven. I most often melt chocolate in the microwave. Chocolate burns easily so whether you melt it on the stove or in the microwave it requires close attention. The first time you burn chocolate in the microwave you will be reminded…chocolate burns easily. The second time you might think, “that was an expensive mistake”. We learn from our mistakes so try and learn quickly. I’m pretty sure I have burnt chocolate in the microwave more than twice. Place the chocolate in a bowl just large enough to hold the amount of chocolate you are melting. Heat the chocolate on high for one minute. Stir. Heat again for 30 seconds and stir. Repeat in 30 second increments, stirring each time until the chocolate is smooth. After the first minute I leave the spatula in the bowl and microwave it too. Whether you burnt the chocolate or were a rock star for giving beautifully wrapped bags of White Chocolate Candy Cane Popcorn I would love to hear your story in the comments below. Line one or two baking sheets with waxed paper or parchment paper. Set aside. Put popcorn in a large bowl with lots of room to stir the mixture together. Crush candy canes to measure 1/2 cup. Sprinkle over the popcorn. Melt chocolate on the stove or in the microwave until smooth. Pour chocolate over the popcorn mixture and gently stir with a large spatula until evenly mixed. Spread onto the prepared baking sheets and allow to cool and harden. You can do this in the fridge or outside if you are in a hurry. Once set break popcorn into chunks. For a fancy presentation serve in a large glass bowl decorated with candy canes. For gift giving portion popcorn into small cellophane bags and tie with ribbon.